These pastas need to be in your repertoire! Both are extremely easy to make and, more importantly, don’t require any special tools or pasta rollers to make them. 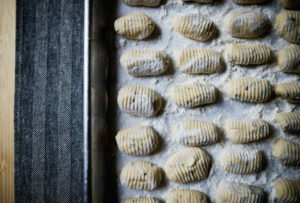 Gnudi are beautiful little dumplings that are made in a similar fashion to gnocchi with the main difference being they are made with ricotta cheese instead of potato. Get your hands in the action then enjoy a three course dinner prepared by us! Follow the link for more information and to purchase you tickets today!